The signature dish of the Alsatian region, Choucroute is perfect for those with hearty appetites. 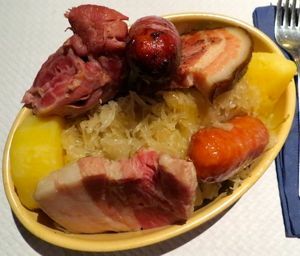 The most famous Alsatian meal is Choucroute Garnie, or sauerkraut with garnishes. You'll find it on virtually all restaurant menus in Strasbourg and Colmar and elsewhere in Alsace. As you can see from the picture at right, it's a hearty meal. The "garnishes" are several different kinds of sausages and other cuts of pork. It might include frankfurt sausages, Strasbourg sausages, salt pork, ham hocks, or pork shoulder. It's also traditionally served with potatoes. For those who would enjoy a lighter meal, many restaurants also offer choucroute with fish—sometimes just one kind of fish, other times three types. The sauerkraut doesn't seem to be as sour as some varieties, perhaps because it is rinsed well and traditionally cooked with a glass of Riesling wine. If you see choucroute royale on a menu, it might be cooked with champagne rather than Riesling. Some restaurants also advertise how many garnies their choucroute has, as in "choucroute à quatre garnies," with four meats.